Today In his home country of Thailand, bantamweight king and pound-for-pound entrant Srisaket Sor Rungvisai blasted out mismatch foe Young Gil Bae in a round in a non title catch-weight fight that took place at 120 pounds. The poor match-up – really a waste of time as anything other than a chance for hero Rungvisai getting the opportunity to box in front of his adoring fans – was over at the 2:50 mark of the very first round. Arguably the single best fighter in the world with the lowest profile, globally speaking, the magnificent Thai will engage in far tougher and far more meaningful and important fights soon. Twice a conqueror of Roman “Chocolatito” Gonzalez, Rungvisai is set to fight again on October 6 in Bangkok (against a TBA). Fans should get to see more of the tough warrior then. Against Gil Bae, a 38 year old who had not fought in well over a year, “The Baddest Little Big Man Of The Sport” really had nothing at all to beat. Again, it was a waste of this great fighter’s considerable talents today. He and his fans know what Rungvisai is really about though. Even a special fighter is entitled to an easy one every now and again. 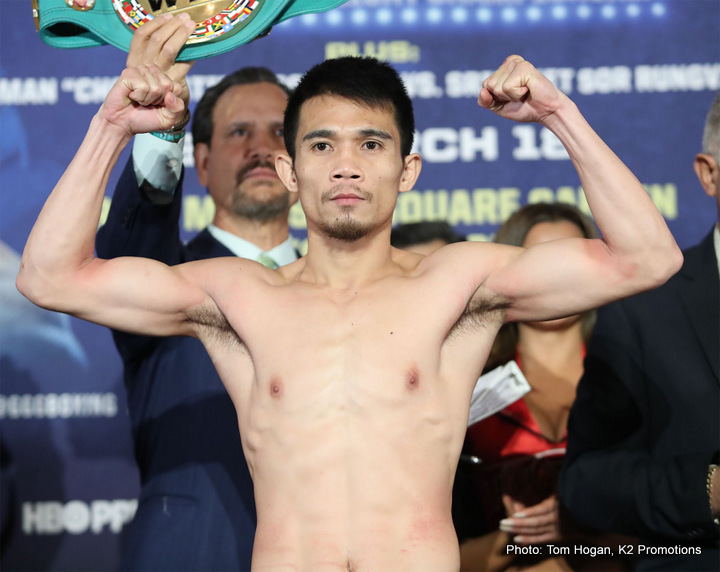 Roc Nation boxers Zhang Zhilei, Meng Fanlong and Darmani Rock shined under the bright lights of the ShoBox stage on Friday, each claiming victories at the WinnaVegas Casino & Resort Event Center and polishing their unblemished records. In his first bout in 10 months, Zhilei (19-0, 5 KOs) showed little sign of rust, delivering a barrage of punches and knocking out Eugen Buchmiller (11-3, 8 KOs) in the first round to successfully defended his WBO Oriental Heavyweight title. It marked the sixth straight bout where Zhilei had recorded a first-round knockout. Earlier in the evening, Fanlong (13-0, 8 KOs) enjoyed a similar outing in the ring, recording a first-round knockout of Chris Eppley (11-5). The bout was Fanlong’s first fight since October 28, 2017, when he claimed the vacant IBF Intercontinental Light Heavyweight Title at the Macau East Asian Games Dome in China. Rock (12-0, 7 KOs) went the distance in a four-round bout against Marquis Valentine (5-3, 2 KOs), claiming a unanimous decision victory (60-54, 60-54, 59-55). The outing resulted in Rock’s third victory over the past seven months. As a result of Friday’s victory, Zhilei and Fanlong are now world-rated and are focused on getting world championship bouts.